If a taste for traditional Christmas foods were a gene, I was surely born with a defective one. You could populate a small planet with the number of fruitcakes that have made me gag, and if there were an award for gastronomic martyrdom it would surely go to me for all the sawdust-flavored Christmas cookies I’ve swallowed. I’ve politely licked my lips after eating mealy German lebkuchen and not-so-politely spit out my first ever taste of a British mince pie. I unhappily soldiered through a whole bowlful of dried fruit compote one Christmas in Spain, and I felt my stomach seize up after one leaden bite of steamed Christmas pudding in Ireland. After contemplating the idea that maybe I do suffer from some kind of rare genetic deficiency that prevents me from enjoying these seasonal delights, I decided instead it may just be a blessing in disguise – after all, if I simply avoided all the calorie-traps of the season, I would have that much less dietary damage control to contend with come January. This might have actually worked, were there not one deliciously creamy exception to the rule. In a word: eggnog. I love it. I also wait all year for it. I usually start thinking about eggnog in early spring, when the memories of last year’s indulgence are a distant memory and the next season’s batch lies an interminable wait away. By late summer I’ll have started suffering tremors and sweating at the thought of it, and by autumn I’ll be calculating exactly how many days, hours and minutes remain until I can legitimately take my first sip. In the U.S. this date is decided for me since eggnog doesn’t hit the shelves until a few weeks before Christmas. In eggnog-less Britain, however, I’m working from a blank slate: if I can make it, I can drink it, no matter what time of year, and it’s only a vague sense of seasonal impropriety that has kept me from declaring it a year-round libation. The exact nature of eggnog sometimes confuses non-Americans. Unlike brownies and chocolate chip cookies, this particular North American culinary heavyweight hasn’t gained popularity across many international frontiers. Several sources tell me that its origins actually lie in England, where a drink called posset was popular in the nineteenth century among those who could afford dairy, eggs and brandy. Nowadays I’m told it goes by the name ‘egg flip’ in the British Isles, and takes the form of a hasty concoction of booze, eggs and sugar – but let’s be honest, I’ve never been standing around at an office Christmas party and had anyone offer me a cup of egg flip to ease the pain. If it exists, it must be rare. I also encountered something mildly reminiscent of eggnog in Germany and Holland – Eierlikör, or Advocaat, an intensely sweet liquor flavored with egg yolks and cream that makes frequent appearances in tiny glasses and the interiors of cheap chocolate assortments. I’m told by Germans that nowadays it’s associated with conservative traditions and grandparents’ liquor cabinets, neither of which contribute much to its dwindling popularity. 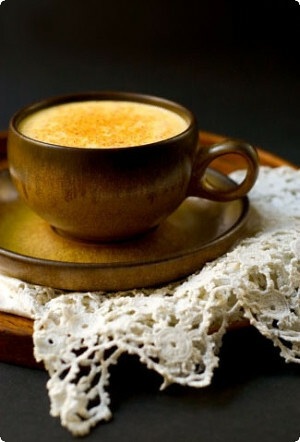 In any case, it certainly can’t hold a candle to real eggnog, with its silken, custardy texture, fragrant bouquet of spices and creamy sweetness that slides down your throat like crushed velvet. Eggnog stands up to the punchy fire of strong liquor, but is comforting and flavorful enough to also be quietly sipped on its own. And until you’ve made your own eggnog, you don’t know just how heavenly it can be. Yes, why not? Most Christmas sweets I’m happy to refuse to allow on my table at other times because really, once a year is already more than enough. But to restrict the consumption of things we really love based on the date alone – well, perhaps that’s just silly. Life’s short enough on enjoyment already. So yes, my friend now happily gets his eggnog in July, and I get what I secretly wanted all along – another legitimate excuse to drink it. Heat the milk and sugar in a saucepan with a lid. Split open the vanilla bean and scrape the seeds into the milk; cut the pod into four or five pieces and add it too along with the mace, nutmeg, cinnamon and salt. Bring everything just to a boil, remove from the heat and let steep, covered, for at least 30 minutes. Return the pan to the heat and bring to a gentle simmer over medium-low heat. In a bowl whisk the egg yolks until frothy. Temper the yolks by adding about 1/2 cup of the hot milk to them, stir well and then add them into the pan with the rest of the milk, stirring quickly until incorporated. Continue to heat the mixture, stirring constantly, until it thickens slightly and coats the back of a spoon, being careful not to let it boil. Remove the pan from the heat and quickly stir in the heavy cream—this will bring the temperature down and prevent it from curdling as it sits. Transfer to a covered container and chill several hours until cold. Strain the mixture through a fine-meshed sieve, discarding the vanilla and cinnamon. Serve cold, sprinkling each serving with more nutmeg before drinking (this is de rigueur). Drink as is, stir in some of your favorite booze (I like dark rum), or use to whiten (and sweeten) your morning coffee. Eggnog will keep up to a week in the refrigerator. My Dad always used to drink something he called egg flip whenever he had a cold. I don’t think it bears much resemblance to your recipe though. And he always drank it out an orange tupperware bowl for some reason. Because of this unappetising sight I’ve never been too keen on the idea of eggnog but maybe I’ll give it a go after all. In a time far, far away in a galaxy long ago I used to absolutely love Advocaat. Haven’t seen it around for quite some time, so me and Advocaat have sort of fallen out of love lately… Great post, love the story about your Indian friend. Will have to try this on my flatmates this christmas. Melissa, that is one gorgeous mug of egg nog! I’m glad to see that we share a passion for nog, although as you know, I was raised in a family that likes its eggs and cream with a hefty dose of booze! Ours is a rough-and-tumble thing, sophisticated but without an ounce of subtlety. Yours, on the other hand, looks and sounds like a wondrously delicate sort of drinkable pot de creme. I can’t wait to try it. Thank you, my dear! you take such nice pictures, love your blog!! Eggnog is something that I’ve never tried commercially. In the Philippines, hardly anyone knows it exists, so I can forget about buying it from the grocery store come Christmas. So I make it for myself, and being an egg-lover, I love it, of course. Your recipe looks like the one I’ll do this Christmas. Thanks for sharing it. I was with you until the end. "Keep up to a week"? Ha! It wouldn’t keep for two days in my refrigerator. Hi Melissa, it seems eggnog is the talk of the town these days! I have NEVER in my life been a fan of eggnog but there are some gorgeous recipes floating around and yours sounds particularly delicious, and the picture makes it doubly tempting. Though I think for my first time making it I will do as Molly’s family does and add that rum "without an ounce of subtlety".. But seriously, Im still shocked that I actually want to try making eggnog now.. I’ll probably love it too..
What a beautiful picture again Melissa! I so wish that you win the best food blog/ photography category (I nominated you with many others) I’ve never had eggnog but this post makes me want to try it!Thank you! I have been looking for THE egg nog recipe. Lovely post and picture, I just need to try it out now. It sounds (and I am sure it tastes) delicious. Thanks for the recipe. Looks delicious but dangerous for the waist line! I think you may not like Christmas sweets because most pre-packaged goods are made with cheap ingredients. I think standard fruitcake is an abomination, but there is one fruitcake that I love. Various versions are in Alice M’s Chocolat, Chocolate and the Art of Low-Fat Baking and Cookies and Brownies. If you like chewy sticky fruit offset with a little crunch, you will love the recipe! I am obsessed with egg nog lattes…. Holy sa-moke! That is the recipe-est recipe for eggnog I’ve ever looked at. And I might just give it a try. I just had my first swig of eggnog for the season today. Commercial stuff, and all we added was the rum and freshly grated nutmeg, but good. I’m back to tell you I made the eggnog. I served it booze-less at my niece’s birthday party. It disapeared very quickly.I didn’t have mace on hand. I replaced it with a star anise (I know, not at all the same "catogory" of taste/flavours but…). The spices lend a very delicate flavor which compliments so well the creaminess of the eggnog.This is definetly a keeper. I have been "ordered" by my brother-in-law to remake it for the family’s Christmas party next week. And he’s known for being a picky eater…Thank you. I love a good eggnog too, I don’t think it was always for Christmas. In Laura Ingalls Wilders’ book Farmer Boy, eggnog was the mid-morning and mid-afternoon thirst-quenching (and filling I’m sure) beverage during the hot haying season. Her description: "The egg-nog was made of milk and cream, with plenty of milk and sugar.Its foamy top was freckled with spices, and pieces of ice floated in it." gagh "…with plenty of *eggs* and sugar…"
Hey, thanks for visiting. I recommend the Bittman book very highly. I’ve made four things from it and all were things I would make again. I rarely have that experience with a cookbook. He’s great. Is it terrible that I’ve run out of adjectives to describe your photographs? I’m reduced to just sitting here in awe. As for the Nog in question, I’m one of those that seems to be on the fence – when it is very good, I adore it, but all to often I’m disappointed and leave my cup after the merest of sips. I am always tempted to give it another chance, and between you and Molly I may be convinced. Hi Melissa,We kicked off our Christmas lunch with a round of your eggnog today. Thank you for the lovely gift, it’s most definitely a keeper! Happy holidays. Hi Melissa,Wow!!! I’ve just found this site and it’s made me really excited me to try out some of your amazing recipes! Sorry about the late posting here, but it seemed as good a place as any. Maybe you’re right about eggflip being more popular in the colonies – I live in Australia, and my Nanna used to make me her version when I was little. Hers was more like a vanilla milkshake with egg and spices- definitely a kid’s drink. Having missed the boat on the eggnog for last Christmas, I think maybe I’ll save it up for an American Christmas curiosity later this year, and instead try and get my Nanna to make me another of her eggflips. Thanks for the wonderful recipes & writing, beautiful photos, and some nice memories! Hi Karyn, it’s actually a cold drink, though the shot of booze is meant to warm you up on an cold winter’s day (all those calories don’t hurt either!). Sounds to me like just the perfect thing to bring some festive spirit to July. Hope you enjoy it! Coming from a non-eggnog drinking culture I have always wondered what it was, especially after seeing it in every American Christmas movie. Thanks your post has been very interesting. I would love to bring this to a Christmas dinner this year but I don’t have any mace. I’m hoping to be able to substitute nutmeg for the mace (i.e., total of 3/4 tsp. nutmeg for 1 L of milk), but I’m wondering if this is maybe a bit too much nutmeg? Should I decrease it to 1/2 tsp. ?Can you believe I’ve been thinking about this recipe since the summer?! And with one week to go before Christmas, I can’t wait to give it a try…thank you so much for sharing, Melissa! It's good alright!! Thanks for sharing the recipe.